Rising Star Competition Trophy - 20"
Cascading stars top our Rising Star Competition Trophy – 20”. This trophy is great for any event, but especially dance competitions and music festivals. A trio of 3 stars measuring 6 inches tall is highlighted at the top of the trophy, flanked by golden stars! 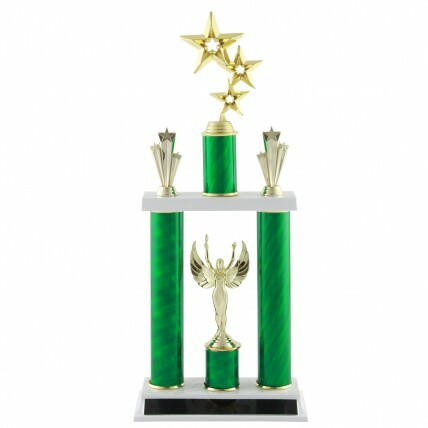 Standing 20 inches, the trophy includes your choice of red, blue or green swirling column.